Meet our tour guide & driver at Tianjin Port and drive to Beijing City (about 3 hours). Upon your arrival, we are heading for Tiananmen Square and Forbidden City. Tiananmen Square is the largest square in the world, it has become the symbol of China. 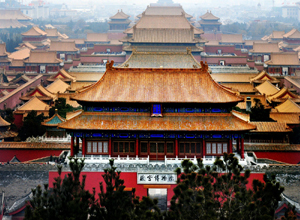 Forbidden is the place where 24 emperors from Ming to Qing Dynasties lived in. After the tour, we’ll take you back to hotel. In the morning, pick up by our tour guide and driver, we will set out to Mutianyu Great Wall and Ming Tombs. Mutianyu Great Wall is one of the most famous part but less crowded and is famous for its beautiful scenery. Then, we’ll visit Changling Tomb where lie the third emperor of Ming Dynasty, Emperor Zhu Di and his Empress Xu. It is the largest, original and the best preserved among the thirteen tombs. On the way back to downtown, we will go to the Olympic Green for a short exterior visit to the Bird’s Nest and Water Cube. After ending the tour, we will take you back to hotel. Today, we will arrange three attractions for you, our tour guide and driver will pick you up from the hotel and transfer you to Temple of Heaven, which was the venue for the Ming and Qing emperors to offer sacrifices to the Heaven and pray for harvest. Afterwards, we are going to visit Hutong tour with Rickshaw. It is one of the symbols of Beijing, everyone who visit Beijing wants to feel the unique culture of Hutong. In the afternoon, we plan to visit Summer Palace, the largest royal garden and has reputed as Royal Park Museum. After the tour, you will be taken back to hotel. Free time for your own leisure before be transferred to airport. Thanks for choosing our services!